I'm a big fan of Oprah! I love that she is so generous, successful and relatable. She once said “I am a woman in process. I’m just trying like everybody else. I try to take every conflict, every experience, and learn from it." Just like Oprah, I am a woman in process. I'm trying to focus my energy on becoming the best person I can be. Part of becoming better is recognizing areas for improvement. I've taken some giant steps to becoming physically and mentally better. No Sweets November is going so well and I've been working hard at the gym nearly every single day, and now that I have a routine I want to focus my energy on advancing professionally. A couple of my biggest areas for improvement are politics and my poker face. As a graduate student I had been "warned" that our field was really political and that it was important for me to learn how to "play the game." To which I responded, "if I wanted to mess with politics I would have gone into politics." Well, I'm learning higher education and politics have a lot in common and I have a lot to learn. My other challenge is my poker face. I wear my emotions on my sleeve and that's been an issue since I started my first professional position. If decisions are made or something is said that I don't necessarily agree with I react. I may never say a word, but you can usually tell how I feel by the look on my face. At my last position, my supervisor brought this to my attention and I've been working on it ever since. I know I've improved, but I've noticed I have been reacting when other people get excited and that doesn't always set me up for success. These are a couple of things I plan to focus on in the next few weeks/months/years. They say the first step to recovery is admitting the issue and now it's time for me to intentionally focus on improving these areas. It is hard to recognize your flaws, but it's important to remember you are a work in progress and it's okay to not be perfect. Spend some time this week to reflect and identify some areas for improvement and make a commitment to becoming better. 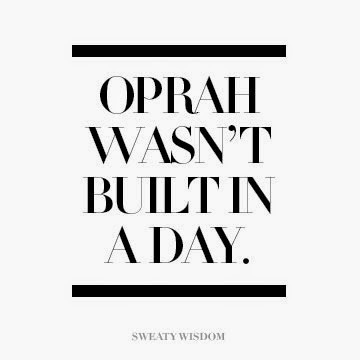 It will take time, but just like Rome, Oprah wasn't built in a day!